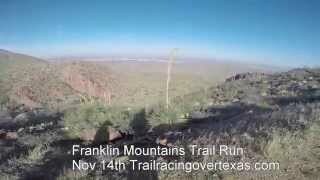 One of only two trail races to take advantage of the extensive Franklin Mountains State Park network, the Jackrabbit Classic has been run for over fifteen years, growing in popularity each time. Listed as a seven-miler but closer to eight, the race is run mostly on scenic Lower Sunset, one of the nicest trails in the system. The route has many challenging, technical segments, and two long climbs, including an tiring uphill segment over the last half mile. Experienced runners will enjoy the challenge, beginning ones may find themselves power hiking at times. Make sure to arrive early. The usual entrance fee of $5 for adults and $2 for children under 12 is waived for participants - but not spectators - but each individual car is checked in at the gate, resulting in long lines and backups. Close-in parking fills quickly as well. Overnight camping is available. Checking in at a table near the starting line is mandatory for the trail race. After the first mile, run on asphalt, the race is a rocky, moderately technical singletrack. Trail shoes with rock plates are strongly recommended. Skip the racing flats. April morning weather in El Paso will be good for racing, usually 40 to 60 degrees. Rain is a possibility, as are strong winds, but recent years have avoided both. The race begins and finishes at the northern end of the park access road. Be sure to check in at the registration table. The first mile and a quarter of the course is a fast downhill on the access road. It's tempting to get speed up and expend energy needed for the trail here. The course turns right to climb up to the southern Lower Sunset trailhead, but is only on the trail briefly before veering onto the Beginner's Loop. This easy, winding mile makes for a nice warm up to the real trail ahead, as runners settle into their pace. The first water stop is located at the end of the Loop where it rejoins Lower Sunset. The trail continues as a gravel doubletrack for about a half mile before narrowing to a rocky singletrack after turning north. The next three and a half miles feature ups and downs, twists, and a few arroyo crossings. Don't be distracted by the view towards the west of New and Old Mexico; taking eyes off the technical trail can easily result in a fall. The trail splits at the three and three-quarters point; a marker shows a Difficult segment to the left and Moderate one to the right. The right segment is the one taken by the race. Stay sharp a mile later when the trail turns east, as a segment proceeds north from here towards a quarry on private land. The main trail is the better-defined one. This also marks the start of a winding, mile-long climb. The second water stop is at the top near the shortcut back to the trailhead. As the trail turns back west along a cliff face, runners will be treated to one of the nicest views in Tom Mays, looking out over a canyon with the Chihuahuan Desert stretching out in the distance. The trail continues as a gradual downhill, loops to the north, and widens to doubletrack. Once again, the course climbs here, becoming particularly brutal for the last half mile, just after the sign for Schaeffer Shuffle. Push through and to the top to the finish.